Southern Colorado has a secret. If you look closely, you can discover it in the unexplored cliffs of the Needles and La Plata Mountain Ranges. Southern Colorado has a secret. If you look closely, you can discover it in the unexplored cliffs of the Needles and La Plata Mountain Ranges. If you listen, you can almost hear it whispering in the preternatural rock outcroppings of Mesa Verde National Park. And if you happen to be on the road with three curious kids, as I was, the secrets reveal themselves to you, whether they want to or not. These mountains are alive with history and adventure and "Look, Mom!" moments. For example, it takes only a few hours here before you're dying to find out who built the cliff dwellings of Mesa Verde. How was this place discovered? And how did it become the first national park of its kind in the United States? And, oh yeah, there's an X-Files episode in here, too. I'll get to that in a minute. 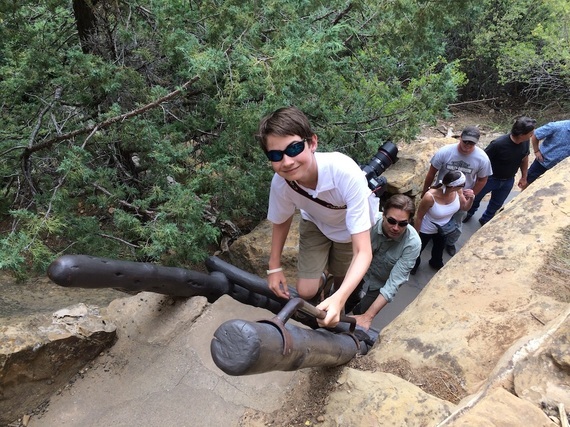 Mesa Verde, which is about a one-hour drive west of Durango, Colo., was one of the Ute tribe's best-kept secrets until the late 1800s, when the cliff dwellings were discovered not by archeologists, but cowboys. The Wetherills, a ranching family, started wrangling cattle in southern Colorado back in 1881. They often explored the mesa for artifacts while corralling stray heifers. A Ute named Acowitz approached them one day describing a city of houses of the ancient ones built deep in the canyons. He warned them that the place was sacred and Utes never go there. But in 1888, as they searched for stray cattle, Wetherill and his brother-in-law, Charles Mason, were caught in a sudden snowstorm and sought shelter. What they discovered they described as a cliff palace built into the side of the canyon walls. That's actually an understatement. Mesa Verde is more like a city inside a mountain, like something J.R.R. Tolkien might have dreamed up for a Hobbit sequel. Except that it's real. Imagine a vertical rock face with a city carved into it. Inside, are expertly constructed stone masonry buildings, some with plaster painted in red and pink. There is nothing else like it on Earth. All of which brings us to the first mystery: Who built this? Archeologists and historians are still uncertain who these early farmers were or why they left. Once we called them Anasazi, a Native American term which means the Ancient Ones, but now they're known as the Ancestral Puebloans. That 's because the stories of the cliff dwellers and their masonry are part of the Pueblo Indian oral history. 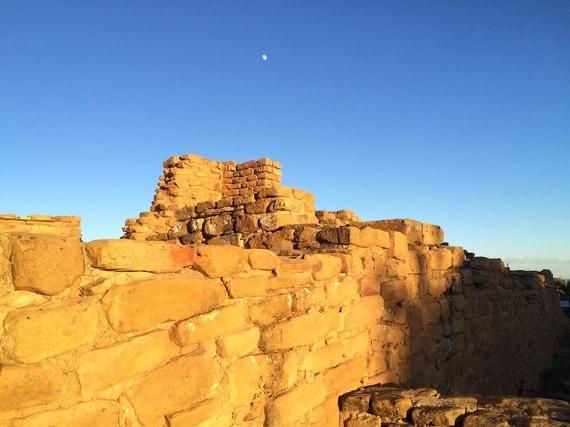 Mesa Verde has over 4,700 archaeological sites including 600 cliff dwellings and the mesa top sites of pit houses, pueblos, towers, and farming structures. These structured communities only lead to more questions about early ancient culture. "Aliens built it," my 13-year-old son declared. Actually, there's an extraterrestrial element to this story. Wait for it. Most visitors are familiar with the cities carved into the canyon, but what you may not know is that the oldest part of the park isn't the cliff dwellings. Those were only inhabited in the 1200s. It's believed that between 500 and 1100 A.D. the people lived on top of the mesa in semi-subterranean pit houses later known as Kivas. They hunted and gathered native juniper berries while planting a form of corn they picked up from other nomadic tribes to the south. In 1906, President Theodore Roosevelt established Mesa Verde as the first national park to preserve the efforts of early mankind. Few people make it to the four corners, where Arizona, Utah, New Mexico and Colorado meet. And even fewer to the historic homes of the Ancient Puebloans. But those who do soon discover, to their delight, the many mysteries and secrets to visiting this sacred place. Don't let me keep you in suspense any longer. Here's where things get a little Twilight Zone-y. 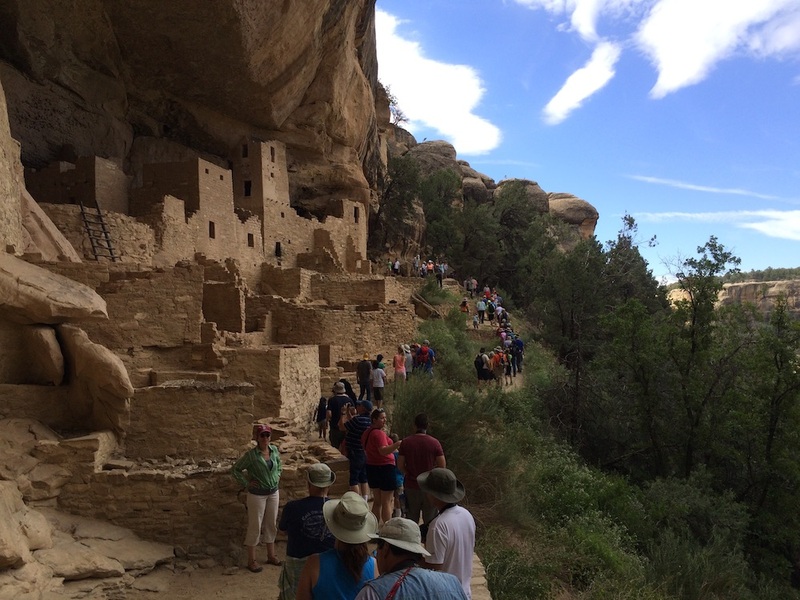 The kivas act as a religious and social center for cliff dwellings communities. Each kiva has a hole dug in the north of the sunken chamber called a sipapu. A sipapu was described to us by our native american guide as a hole in the floor of a Pueblo Indian kiva symbolizing the place where the mythical tribal ancestors first emerged from the primordial underworld regions into the earthly realm. Maybe our son was right. Maybe this place was built by aliens. Wait a sec, I've gotta take this call. It's from someone named von Däniken. Even if you're not in touch with your inner Fox Mulder, there's still plenty of excitement at the park. The drive from the park entrance to the cliff dwellings can be a thrill in and of itself. There are lots of hairpin turns, sudden drop-offs and gaping canyons that invite your SUV to take the plunge. We politely declined, although we dodged a few animals, including a huge large owl on the moonless night we started our long drive home. There are plenty of reasons to stop along the way. If you plan on taking any of the ranger-guided tours, you need to get tickets at the park entrance visitor's center. They don't offer tickets anywhere else in the park, with only one exception -- you may book a tour through the Far View Lodge, the closest accommodations outside of camping. Their tours are offered only a few times a day, but absolutely worth it. Something tells me this infrequently-visited part of America has a few more secrets to discover. We can't wait to return to Southern Colorado to find out.